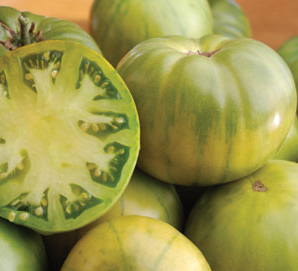 A Canadian heirloom developed to ripen in a short growing season. A vigorous variety, it bears heavy yields of 3-4 inch crimson red fruit with a refreshing, tangy tomato taste. Great for slicing or for canning. One of the most productive early varieties. An American heirloom. Fruits are 8-10 oz, orange-red and perfectly round with a great tomato flavour. Very productive compact plants bear quick and early. Grows very well in containers. A Quebec heirloom the bush type plants are great producers of perfectly round fruit with slightly flat tops. Rosy red colour, rich, meaty taste. Good salad tomato. Grows well in cool conditions. Early. good yields of 3 inch diameter delicious fruit, quite early. Click here for information on buying seedlings. Perhaps the best known and most beloved heirloom of them all. Sweet and juicy beefsteak that can weigh up to one pound or more. Dark pinkish-red flesh is smooth and juicy. Potato-leaf variety. This Russian heirloom is named after the crown worn by Russian Tsars. The plants produce huge, tasty, heart shaped tomatoes that can grow up to 2lbs. One of the earliest large varieties. An Italian heirloom that came to me directly from Rome, this tomato starts later but then just keeps on producing. 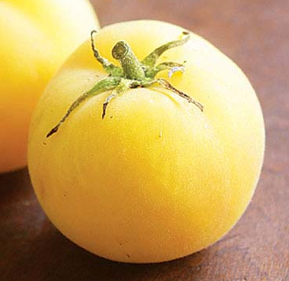 It’s round with prominent lobed shoulders, making it an unusual-looking tomato with a wonderful intense flavour. A very rare yet vigorous Roman heirloom that bears good crops of meaty deep red beefsteak tomatoes that are great fresh but renown for making fabulously tasty sauce. Italian heirloom variety. Heavy yields of small, red, very flavourful plum-shaped fruits on small plants. Excellent for sun-drying. And good for small gardens. Mid-season. These long, roma-shaped tomatoes have beautiful orange stripes running down the length of the fruit. Tomatoes are very thick and meaty with a nice rich flavour. Plants have a good yield and make a delicious sauce. Mid-season. Heirloom originally from Greece. Medium sized red fruits have great tomato flavour and have a nice balance of acid and sweet. Plants are very productive. Very popular heritage variety from Quebec. Round pinky-red fruit. One of the very best for taste- sweet and juicy. Mid-season. Indeterminate. The seed comes from a tomato found at a farmer’s market in Minsk, Belarus. The large fruit are a beautiful orange colour and extremely tasty. Quite early for a beefsteak size tomato. Indeterminate. Medium sized fruit have a fuzzy peach-like texture and an excellent sweet taste. Large plant is very productive. Mid-season. Indeterminate. A great tomato. Sweet taste. Very productive. Grows on a compact bush. Early. Determinate. A Russian heirloom tomato that produces an early abundant yield of mahogany colored fruit with an outstanding intense flavour. A potato leaf variety that does very well growing in containers. Determinant. This prolific black heirloom tomato from Russian can reach 8’ tall. Loaded with clusters of 2” plum shaped, reddish brown fruits with green shoulders. Seem to be blight resistant and last well into the fall when other varieties give out. Indeterminate. An heirloom from the Ukraine. 10-12 ounce oblong fruit that are dark reddish black with green shoulders. A very tasty tomato. Mid-season. Indeterminate. Very old variety that is both beautiful and delicious. The fruit is a dark rose/purple with an outstanding sweetness. Very productive. Late season. Indeterminate. Originally from Russia it is named after the American singer and activist. Tolerant of less than ideal growing conditions, the beautiful dark red fruit is absolutely delicious. Mid–season. Indeterminate. An astonishing rare dark purple tomato. Green fruits turn gradually to dark purple when exposed to sunlight. The bottom half of the ripe tomatoes then turns red. Medium size, round fruits. Pinkish red flesh, with subtle, aromatic and fruity flavour. Even the foliage turns purple under cold conditions. Late season. Indeterminate. This very old heirloom resembles tomatoes pictured in 16th century herbal diaries. The distinctive looking small ruffled fruit is a rosy purple blushed bronze when ripe and a great flavour. Quite prolific. Late season. Indeterminate. Click here for information on buying seedling. This is one of my favorite tomatoes. The large plant produces beefsteak sized green fruit is extremely sweet and juicy. And the fruits look gorgeous sliced on a plate. This is a terrific tomato. The compact plant makes it a good choice for containers or small gardens. It is very prolific producing lots of beautiful lime green fruit with a delicious tangy flavour. A real winner. Mid-season. Determinate. This regal beauty is the palest of the white tomatoes. A beefsteak type with a delicious fruity taste, extremely juicy and sweet. And known for its high yields. Indeterminate.